It's Huey, Dewey, and Louie! Donald Duck's nephews are ready to bring the fun to your doorstep! Each colorful 4 1/2-inch tall mini-bust stands on a base of shiny coins. Derived from Disney's DuckTales TV series. Donald Duck's nephews are ready to bring the fun to your doorstep in this colorful 4 1/2-inch tall x 4 1/2-inch long x 3 1/2-inch wide DuckTales Huey Dewey and Louie Grand Jester Mini-Bust Set inspired by Disney's DuckTales TV series. 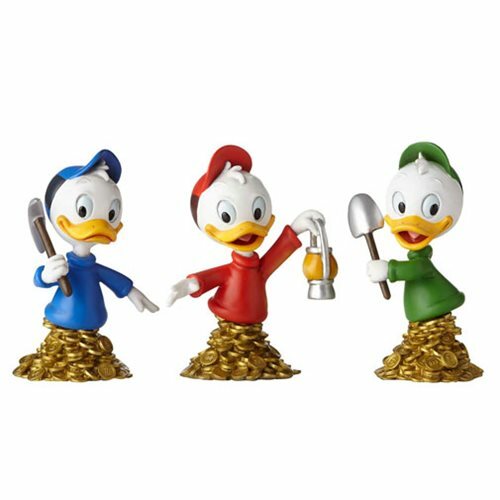 With bases of shiny coins, the triplets are made of stone resin in scale with Uncle Scrooge (sold separately). Ages 13 and up.